Call for entries for veterans' art prize! $8.3 million to provide support for veterans’ employment opportunities through the Prime Minister’s Veterans’ Employment Program and new services to help with the transition to civilian employment. Extended eligibility for the Long Tan Bursary to the grandchildren of Vietnam veterans. $40.7 million in savings resulting in 140,000 DVA cardholders who access DVA dental and allied health services benefiting from improved communication between GPs and allied health service providers; access to an expanded range of services delivered through emerging technologies; and opportunities for enhanced complex care management for our most vulnerable clients. $2.2 million to expand mental health care eligibility to certain Reservists involved in: domestic or international disaster relief; or border protection service; or in a serious training accident. This will provide treatment for any mental health condition without the need to link the condition to the person’s military service, without requiring a diagnosis, and separate from any compensation claim. Investment of $10.8 million to provide veterans with incapacity payments at 100 per cent of their normal earnings when they are engaged in an approved full-time study program as part of their Department of Veterans’ Affairs (DVA) rehabilitation plan. For more information on the Budget measures impacting veterans and their families, visit the 2018-19 Budget section of the DVA website. As the nights get longer and colder, we need to stay warmer, which unfortunately comes with an increased danger of fires from heaters, fireplaces, cooking of hearty food, and electric blankets. When you’re asleep, you lose your sense of smell. A smoke alarm is your electronic nose. A small fire can grow to involve an entire room in two to three minutes – a smoke alarm gives you time to escape, and are legally required for most residences in Australia. Defence Service Homes Insurance offers a range of home, contents and other insurance policies. They provide comprehensive cover with value-for-money premiums, providing the care and attention you deserve and peace of mind you can depend on. They can provide advice on how much to insure your home for, as well as an obligation-free check-up of your current insurance arrangements. 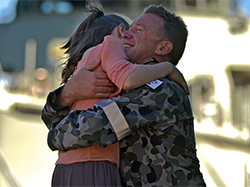 Just visit the Defence Service Homes Insurance website or call 1300 552 662 for more information. Special alarms are also available for people who are deaf or hard-of-hearing. The alarms use strobe lights and will shake the bed to wake you up. DVA’s Rehabilitation Appliances Program (RAP) provides a smoke alarm package for people with a significant hearing impairment. The smoke alarm package includes a photo-electric smoke alarm, a vibration pad and a flashing light. Before a DVA client can obtain the package, an audiologist must undertake an assessment and confirm a profound hearing loss, or a severe hearing loss in the better ear. For more information, contact DVA on freecall 1800 555 254. 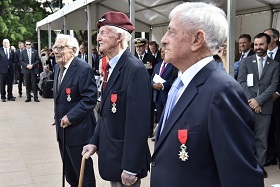 The President of France Emmanuel Macron has personally thanked three Australian veterans of the Second World War during a ceremony in Sydney at which they were awarded the prestigious Legion of Honour for their service during the campaign to liberate France. The Legion of Honour is the highest honour the people of the French Republic can award to a foreign national. 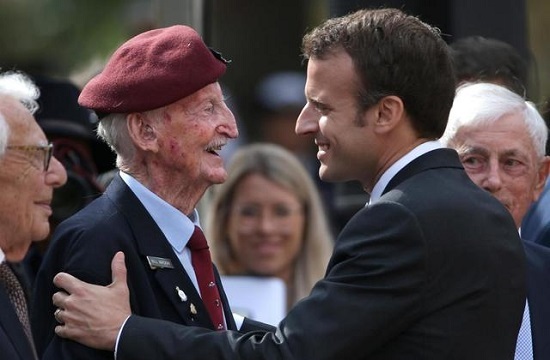 Monsieur Macron acknowledged the efforts of the three recipients, Bill Mackay, Norman (Sandy) Saunders and Louis Solomons, who enlisted in the British forces in the 1940s aged 16, 17 and 23 respectively. ‘It is with emotion and honour that I come to you on behalf of France to say merci,’ the President said to the three men in a stirring speech during a Commemoration Service at the Anzac Memorial in Hyde Park on 2 May 2018. DVA historians’ research was used to support the nominations of the three recipients. Australian Prime Minister Malcolm Turnbull hosted the ceremony along with NSW Premier Gladys Berejiklian. Monsieur Macron was the guest of honour. Repatriation Commissioner Major-General Mark Kelly AO DSC was master of ceremonies for the event, which was organised by the Department of the Prime Minister and Cabinet to commemorate the service and sacrifice of Australian and French men and women during the First and Second World Wars. Mr Turnbull and Monsieur Macron delivered moving commemorative addresses while Ms Berejiklian recited the poem ‘In Flanders Field’. Schoolchildren from Australia and France also read letters written by Australian and French soldiers from the Western Front a century ago. Federal MP Mike Kelly’s recollectionsof serving in war-ravaged Somalia 25 years ago. The Family Support Package for veterans and families covered under the Military Rehabilitation and Compensation Act 2004 commenced on 1 May 2018. The package provides childcare funding, home help and counselling support for immediate family members of eligible veterans, in specific circumstances. To receive this additional funding you will need to meet all eligibility requirements, including having an identified requirement for childcare services or counselling. Further information about the new support package is available on the DVA website. Specific information for widow(er)s is also available. 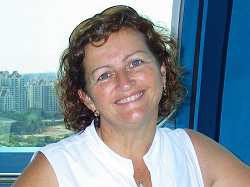 Roylene Glasgow is a DVA rehabilitation success story. Roylene had a military career that spanned nearly 10 years and only retired to start a family. Initially, there was no need for contact with DVA. However, following a fall, which related to an injury sustained during service, Roylene discovered how the DVA Rehabilitation Program could help her move forward in her civilian life. You can hear the rest of Roylene’s storyon the DVA website. The DVA Rehabilitation Success Stories series provide insights into the challenges faced by our clients and how DVA rehabilitation helped them get their life back on track. The aim is that by sharing their experiences, veterans will encourage other veterans to seek rehabilitation assistance. These stories showcase how DVA works together with our various rehabilitation providers and consultants around the country to get the best results for our clients. Entries for the first ever national art prize for current and former servicemen and women, the Napier Waller Prize, will open on Monday 11 June 2018 and close on Wednesday 11 July 2018. The prize is presented by the Australian War Memorial (AWM) in partnership with the University of Canberra and is sponsored by Thales Australia. 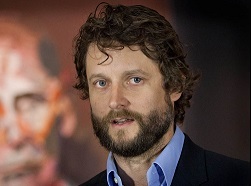 Ben Quilty will be a co-judge for the prize and will provide mentoring to the winning artist. The winner will receive $10,000 in cash, a two-week research residency in the Art Section of the Memorial and a mentoring session with former official war artist and co-judge Ben Quilty. Entries can be in any visual art medium, including but not limited to: painting, photography, printmaking, drawing, sculpture, digital, decorative and installation. The work must not exceed 2x2x2 metres, and must have been completed in the 24 months prior to submission. Only online entries will be accepted. The winning work will be displayed at the Australian War Memorial and acquired for the Memorial’s art collection. The prize is named after artist Napier Waller, who was severely wounded while fighting at Bullecourt in the First World War, and later had his right arm amputated. He went on to create the decorative elements in AWM’s Hall of Memory. A major study to improve advocacy services for veterans and their families is currently underway, led by Mr Robert Cornall AO, former Chair of the Defence Abuse Response Taskforce. The study will examine challenges to veterans and their families in accessing support services for entitlements, as well as models for creating an essential, modern and sustainable advocacy service into the future. Veterans’ advocacy is going through a period of change, driven by demographic shifts and client expectations, such as younger veterans seeking a more professionalised, client centric service. Two recent parliamentary reports (including The Constant Battle: Veteran Suicide)recommended changes to the current advocacy system, including a review of representation at the Veterans’ Review Board. 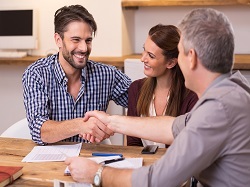 provides personalised advice when claims are unsuccessful, and options for appeals. The veteran, ex-service and Defence communities are being consulted as part of the study, including specific groups such as younger veterans, female veterans and veterans’ families. The study is also seeking the views of relevant policy and technical stakeholders in Australia and overseas, including the Veterans’ Review Board, the Administrative Appeals Tribunal, and representatives from the legal, community, health and disability sectors. A discussion paper will be available soon and submissions to the study will be welcome. For more information, please visit the DVA website. 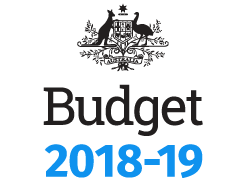 Copyright © 2018 Australian Government Department of Veterans' Affairs, All rights reserved. Invest pride in the uniform, but invest confidence in the soldier.